PREMIER PLASTICS is recommending our customers use 24” dia. UltraRib pipe risers for all models of PREMIER underground water and septic tanks. This riser configuration is more robust and far superior long term than many other tank riser designs currently in the marketplace. The rigidity of the ribbed construction is very resistant to deflection from uneven backfill pressure and settling. 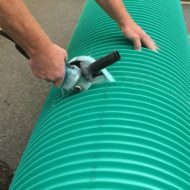 The ability of UltraRib pipe to hold its shape regardless of riser height helps the access opening in the tank (the structural weak point in any tank) stay round and level regardless of ground pressure and potential deformation over time. Also, the drop-on and screw-down heavy duty PolyLok lid will be easy to lift off and put back during periodic service. The riser height can be cut as one piece to within 1.5” of required height. We have a new hand held CUSTOM POWER SAW for UltraRib pipe. The saw can make a guided, clean, straight cut in about 20 seconds. We believe UltraRib Tank Risers with heavy duty screw down PolyLok lids are the best for speed of installation, resistance to warping, leak resistance, long term stability and ease of future lid removal and replacement. For most PREMIER PLASTICS’ underground tanks only two components are needed – the riser and the heavy duty lid. No adapter ring is needed at the neck of the tank opening or at the lid. The molded access lid (supplied with the tank) that screws directly to the tank can be recycled or discarded. The slip joint onto the tank is sealed and secured with E6100 adhesive (for polyethylene). Four lateral SS screws keep the riser in place whilst setting up. The availability of moderately priced UltraRib Connector Rings can reduce wastage from off-cuts to zero. Field time is also reduced. Please click here for our Risers-Below Ground Access Page.